HomeExperience LevelAdvancedDo You Have the Courage & Attention Span for Great Defensive Coverage? Anytime you’ve got 9 players on the field you’re technically in “defensive coverage”. But are you in the right one? And are you brave enough to really make the big defensive moves? Check out some examples of how paying attention and being brave can greatly improve your team defense. Defensive coverage goes far beyond fielding and throwing. It’s positioning your players in such a way that you have a greater chance of stopping the offense than they have of advancing the runner and scoring. Of course, doing this requires constant attention since each Pitch, and certainly each Out can change what the offense is likely going to do, which then changes what you need to setup to prevent. Let’s look at how things like your Attention Span and your Courage, and how each can greatly impact your defensive coverage. Attention Span: Constant diligence is a better phrase. In order for you to ensure you’re always in the best defensive coverage for the particular situation, you’ve got to constantly be watching everything! You’ve got to notice changes the batter’s make, even if slight. Such as runner on 1st, close game and less than 2 outs…has the Batter re-entered into the front of the box this pitch – which means she might be bunting – so how do you quickly adjust your defense. Changing Runners can quickly change an entire defensive scenario – such as forcing your outfield to now throw to 2nd on a base hit vs previously having a play at the plate. How do you quickly signal this change into your defense? The same goes for pinch hitters – which are far more obvious and require far less diligence. If you’ve just made a pitching change with a runner on 3rd, it’s a terrific time to squeeze – have you made the proper coverage change, or are you still frustrated at your now previous pitcher? 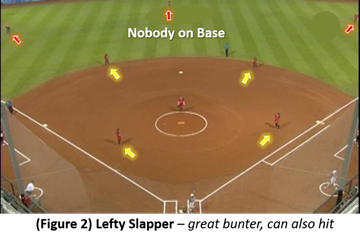 Slapper now has 2 strikes, does that remove her chance of bunting – if so, do you bring your corners back slightly? Constantly being diligent. It’s what all great defensive coverage is based on, which requires a lazer-focused attention span…do you have it?! If not, work on getting it this summer, or else hire someone whose role it is to have it, every pitch of every game. Courage: I totally believe that both trust and bravery (courage) play huge roles in your defensive coverage! It might not be something you’ve even thought of before, so let me show you a couple examples to see if I can change your mind. And thanks to technology, moneyball & Joe Madden’s use of percentages there’s a new trend in very unconventional defensive alignments. We’ve seen this used in baseball with more frequency than in softball, but thanks to Patty Gasso, that’s no longer the case. 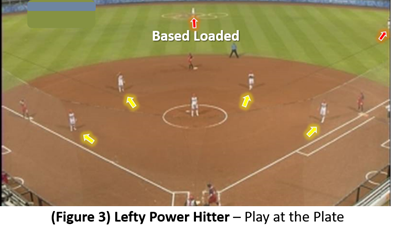 Figure 1 shows Oklahoma’s overloaded defensive coverage that uses 5 infielders and only 2 outfielders. Again, it’s a very specific defense that requires courage to use as any hit down the leftfield line is a double at minimum and scores a run. It also requires faith in the pitcher to throw an outside pitch (righty up) in order to hit into the heart of the infield coverage. But this coverage gives OU’s defense the best chance of forcing the hitter to hit away from her power and hitting into a double play. So the next time you’re in the dugout looking out onto the field, ask yourself – are you being constantly diligent, and do you have the courage to do what it takes to stop your opponent!